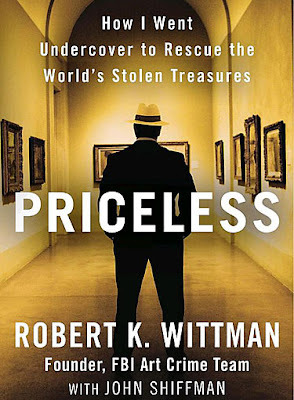 A couple months ago in the blog, I wrote this post about former FBI art-crime investigator Bob Wittman's page-turner of a memoir, "Priceless: How I Went Undercover to Rescue the World's Stolen Treasures." It's a fun and fascinating read. Bob is now in private practice doing art security, and spoke with me by phone to go more in-depth on a couple matters. Here's what he had to say. In the book, you write about your parents, the death of your FBI partner, and your trial. I can imagine a book completely excised of those parts, and instead one that’s just about the cases. Was it always part of the plan to have your personal back story? The book is a memoir. We looked at it from the standpoint of honesty and truthfulness. We wanted to put everything in there. We wanted what was real. When you’re going undercover, you have to have a back story to present to the people you’re trying to get the art back from. How detailed do you have to be in your back story? You have to get detailed to the point where you’re real, or where it's realistic. You have your business, your family, your interests, your hobbies, your education. All these things are levels of what makes a person a person. You have to have all of that to properly convey that you’re a real person. Can you give me an example of when you have to make more stuff up than other times? [In some cases], people don’t want to know anything about you, you don’t want to know anything about them. Many times, someone would say, “Who are you?” And I’d say, “Who are you? You don’t want to know who I am, because I don’t know who you are.” The idea being, if you get caught, you can’t tell on me. That would be a standard over-the-counter buy of stolen property. [But] those are different situations than infiltrating a criminal group, where you’ll be working with people over time. When you’re actually infiltrating a group, you have to give your history, your back story. Because if someone is going to trust you and do criminal activity with you, they’re going to want to know who you are. In any of the cases that went more than a few months—the Santa Fe case, the American Indian artifacts, or the case involving the Rembrandt, where I had to deal with the informant for a long time—all those cases took a pretty deep back-story that had to be used to convince the criminals that I was who I said I was. Did you get better at lying, or at storytelling, in creating these back stories? It’s not getting better or worse. Either you can do it or you can’t. I don’t think it’s a learned craft, to be able to work undercover. It’s something that you have naturally. I wouldn’t call it a talent, I would call it a trait. As I said in the book, you try not to lie. You lie as little as possible. Lying is against the grain. And many times, telling the truth is just as good. You make a good case in the book for why these artworks and antiquities are important. But the images of some artworks—say, a stolen Rodin or Rembrandt—are so ubiquitous, you can get them on the internet in seconds. Does it matter if a Rodin or a Rembrandt gets stolen, if we have the image of it? In both those cases, you’re talking about armed robbery. The guy who robbed the Rodin Museum in Philadelphia, he had a .25 automatic pistol, and shot a round into the wall. So it’s not just about the art that he stole, but a guy who’s willing to go into a public institution with a gun and shoot a round into the wall. Same with the Rembrandt operation. Three individuals went into the Swedish National Museum with machine guns. These are the crimes that have to be investigated and prosecuted. I have a particular fascination with the 1990 heist at the Gardner Museum in Boston. You worked on that case a few years ago, and almost got the art back from some Corsicans who supposedly had it. If it did indeed end up with some Corsican mobsters, what route do you think the art took from the day it was stolen until the time you were on the case? I don’t know. I know what I did in 2006 to 2008 when I investigated that case, working out of Miami and Marseille and Madrid. All I know is where the paintings were then in 2006. I wasn’t interested in who stole the stuff 15 or 20 years before. I was more interested in getting the material back. In 100 years it’s not going to matter whether somebody did 5 years in jail, or 10 years in jail. What matters is that the art is back where it’s supposed to be. You have lots of exciting cases in the book. Is there anything that didn’t make it into the book? I was looking at my cases when I retired, and I pulled everything together, I had about 47 different cases I could choose from. And I could only put these twelve in the book. So maybe book two will have another twelve!